I accompanied my friend to ‘Sinhagad valley’ on Saturday morning. I started from home at 5:30 AM and reached my friend’s place. Two more friends joined in and we all headed for the valley. ‘Sinhagad’ or ‘Sinhagad Fort’ valley is an amazing place for bird watching. In monsoon, there is a stream which flows by the fields and on another hand there are dense trees. Local people use this way to climb up the fort. Valley has now become famous among the birders. All you have to do is – search for a suitable place, sit quietly, set your gadgets (camera, bino, etc) and you could have darshan (glances) of all varieties of the feathered beauties. I have been there twice and that was among some of the best bird watching activities I have done. We reached the base and had tea at local hotel. We climbed up and entered the valley. We scattered in search of different birds. We saw a Crested Serpent Eagle hovering in the sky. And the list is never ending… Along with these birds there are different types of lizards like Garden Colates, etc. After spending good amount of time in the valley, we decided to take its leave. We went to same hotel and had breakfast before returning. For last few consecutive years, I wish I could go to Bhigwan and see Flamingos. Even last year, I missed a chance to accompany my friend. Finally last Saturday got that golden opportunity. We planned to start very early morning and fascination of seeing flamingos made me wake up at 3:40 AM. I packed my sack and we started at 4:30. We enjoyed a ‘LONG’ drive to reach Bhigwan. It was 6:45 and we badly needed a tea break. We went to Hotel Sagar. It was neat clean and breakfast was good. We enjoyed Upma and Idlis with hot sips of tea. Drive approx. 100 Kms to reach Bhigwan village. Take left turn to go to ‘Diksal’ village. 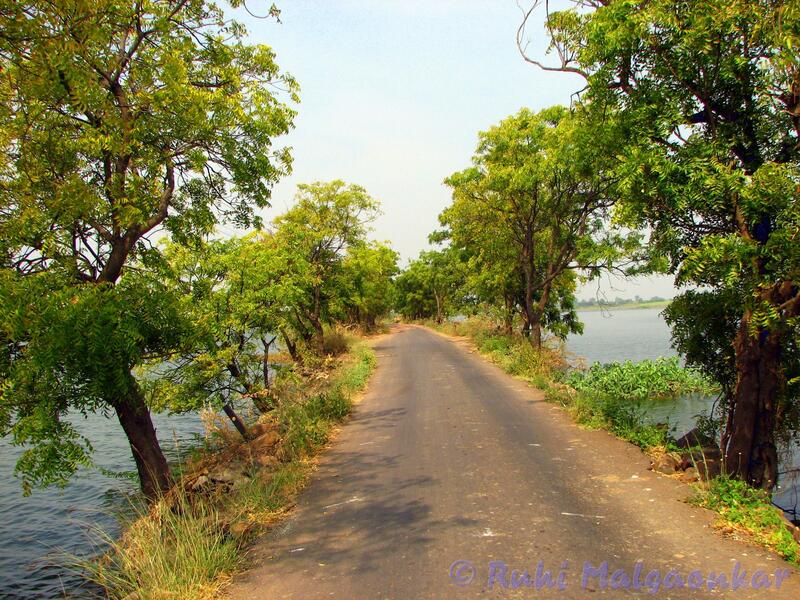 Drive more 8-9 Kms to reach Water bodies. After reaching Diksal, take right to go to an old bridge. Total distance is approx. 110 Kms. We saw a flock of Asian Openbills and we took our first halt here. Another new bird called “Rosy Pastor” (also called “Rosy Starling”) caught our attention. Then there was a pair of Pied Kingfishers, Sea gulls, Teals, Bulbuls. We clicked few snaps and proceeded further. We came at extremely narrow but beautiful road. 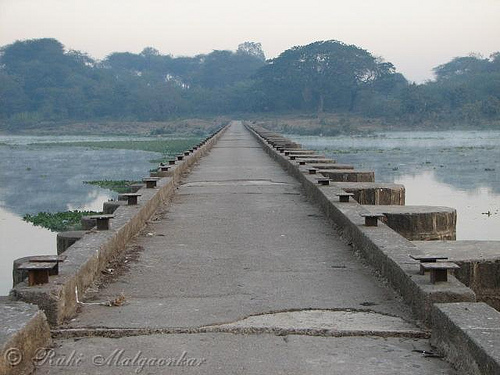 This road covered by water on both the sides, was earlier a railway bridge and now converted into road. Heavy vehicles are not allowed on it. We have to take care that we don’t wait while crossing this stretch. We found Marsh Harrier sitting on the tree here. We crossed the bridge and parked our car. It was pleasant morning and sun rays made water to sparkle. Fishermen were all geared up with their boats for fishing. We enjoyed watching and clicking River terns, Pond herons and sea gulls in action. We waited there for while for boat to come. My friend, who had been to Bhigwan many times has befriended a boatman called “Gangaram”. Gangaram knows exact location of flamingos but he was busy fishing in mid water. We took up another boat and reached him. His own ship was full of fresh fishes that he caught. He jumped in our boat and we started heading in search of flamingos. After 30-35 mins of rowing, we could trace few flocks of flamingoes. It was amazing, just 5 of us, water all around and then there were marvelous flamingos. I was seeing them for first time in natural habitat. I took out my binoculars and kept watching them till we were considerably near to click them. We took our cameras and captured as many shots as we can. My friends with Canon 100-400mm lens were literally ‘shooting’ and their camera sounded like machine gun – “khat-khat-khat-khat!!!”. We found 3 flocks and approached each one in descending order. We turned to second after third flew away. For first time I caught birds in take-off and flight and that too flamingos. My happiness knew no bounds. Research says that flamingos get their pink color due to aqueous bacteria and beta carotene obtained from their food supply. We also found Cormorants, Brahminy ducks, terns, teals, Great (White) Egrets in water. We came back with immense satisfaction. My friends continued shooting few more River terns and I was keen to walk on that narrow road covered by water on both the sides. I found Tree Pipit, Common Sandpiper, Drongos, Small Green Bee Eaters, While-throated Kingfisher, Prinia. The herd of sheep blocked the road for some time. Skilled shepherds guided crossing vehicles instead of controlling their herd. It was fun watching a typical rural life. We came back at Bhigwan and had some snacks before returning back to Pune.